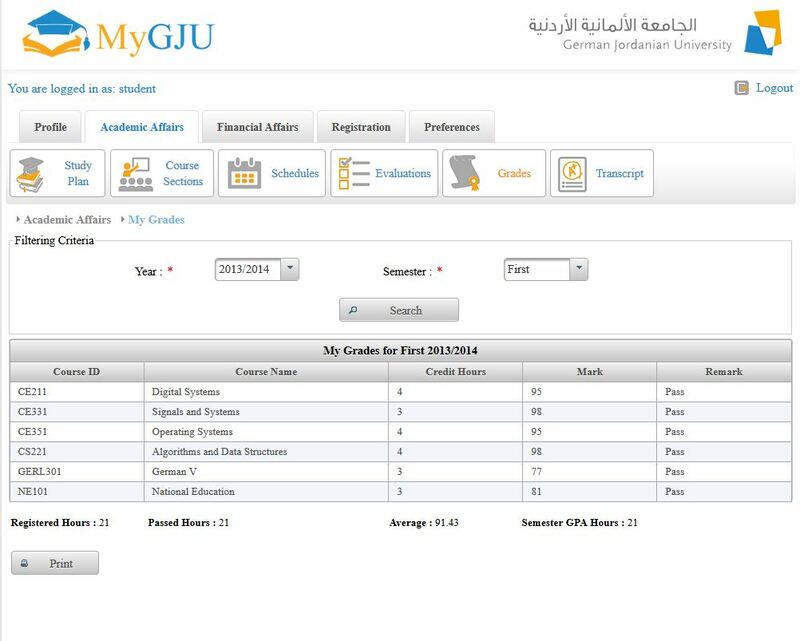 The newly established software development team designed, developed and released a Student Information System named MyGJU starting from the first 2015/2016 semester. MyGJU has three main views: student, instructor, and administrator. All the MyGJU views were designed such that they are feature rich, easy to use, efficient, flexible, reliable, and scalable. The student view allows students to view their personal, academic and financial information as well as add and drop course sections during the registration period. They can check their study plan, schedules, grades, and transcript to manage their academic affairs. In addition, they may use the tuition fees calculator and view their financial statement of account to figure out whether or not to deposit any money in their accounts ahead of registration. Furthermore, they can evaluate their instructors and courses to help the GJU administration assess the performance of the faculty members and enhance the educational process based on their valuable feedback. Wheras, the instructor view enables instructors to view their personal information, schedules, grades and evaluations as well as search all the offered course sections in a selected academic semester. Additionally, instructors can manage, enter, and submit the grades of the students in their course sections. Furthermore, advisors, chairs and deans may view the academic information (e.g., personal information, study plans, schedules, grades, transcripts, holds and financial information) of their students to monitor their academic progress and to provide them with the needed academic advising. Whereas, the deans and chairs may also monitor the registration status, manage (add, edit, view and delete) course sections, view study plans as well as view the instructor grades and evaluations of their schools and departments respectively. While, the administrator view enables the registrars at the GJU to manage the MyGJU system and student information. As part of the system and academic setup tasks the registrars may manage: user details, buildings, rooms, countries, faculties, departments, courses, requisite courses, equivalent courses, study plans, course sections, and prerequisite tests. Moreover, they can use the admission flow to fill the student admission applications as well as reject or accept students. Besides, they have the ability to transfer students to different majors or change their programs. Furthermore, the registrars manage the student personal information, substitute courses, transfer credit, holds, and notes. Additionally, they can perform add, drop, and withdraw course section transactions on behalf of the students. They can also view the student or instructor schedules, grades, or evaluations. In addition, they are responsible for posting the grades to the transcripts and computing the GPA and status for all students. They are capable of finding the expected to graduate students, graduating students, and issuing certificates to the graduates. Last but not least, MyGJU provides the registrars with powerful capabilities to generate various reports for statistical, archiving, and administrative purposes. It is worth noting that MyGJU was designed and developed by Dr. Feras Al-Hawari, Eng. Mai Alshawabkeh, Eng. Anoud Alufeishat, Eng. Hala Barham and Mr. Mohammad Habahbeh. Also click here to access the MyGJU tutorials.